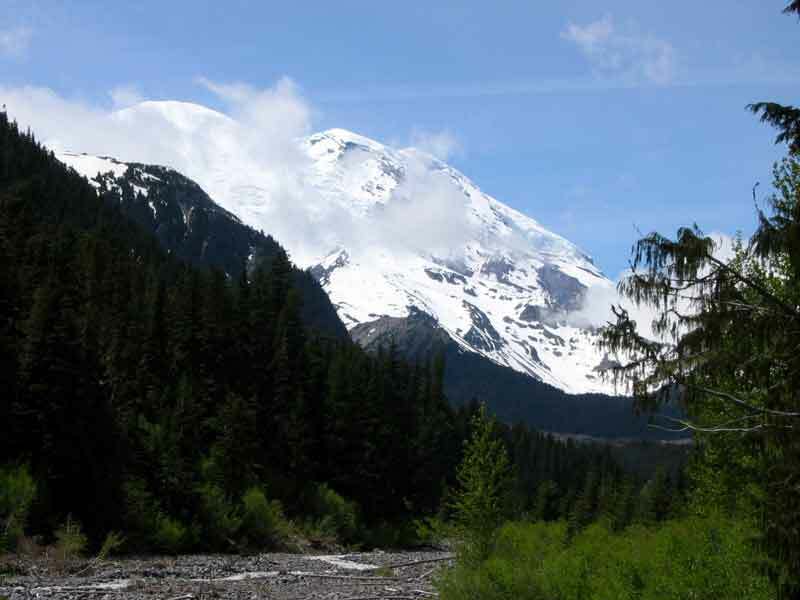 Mt Rainier is a 14,410 foot active volcano in the Cascade Range in west central Washington. It last erupted about 150 years ago. The day we were there it was cloudy and raining at the Paradise Visitor Center and we could not see the mountain. The exhibits are very informative about the characteristics and history of the volcano's activity and its effects on the surroundings. We moved on the the Sunrise area and got some partial views of the mountain as shown in this picture. 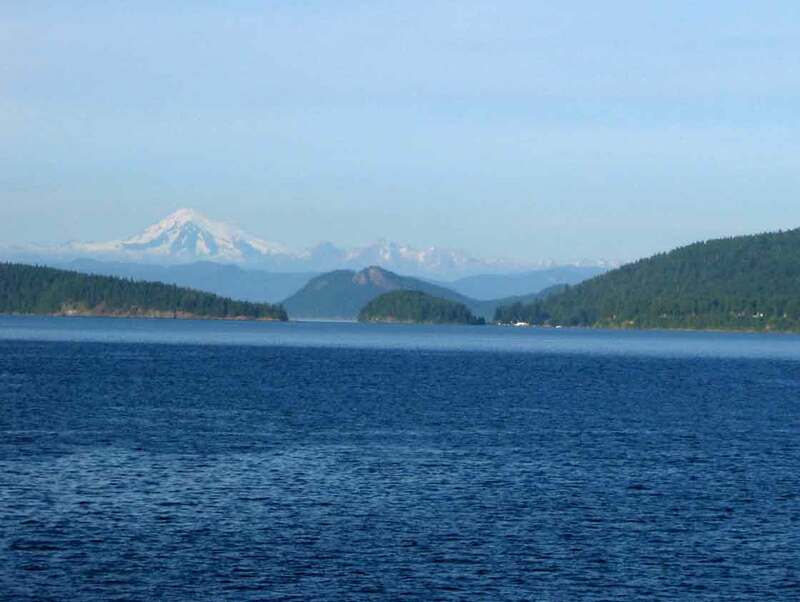 Sequim (pronounced S'Kwim) is a small town on the Strait of Juan de Fuca just east of Port Angeles. 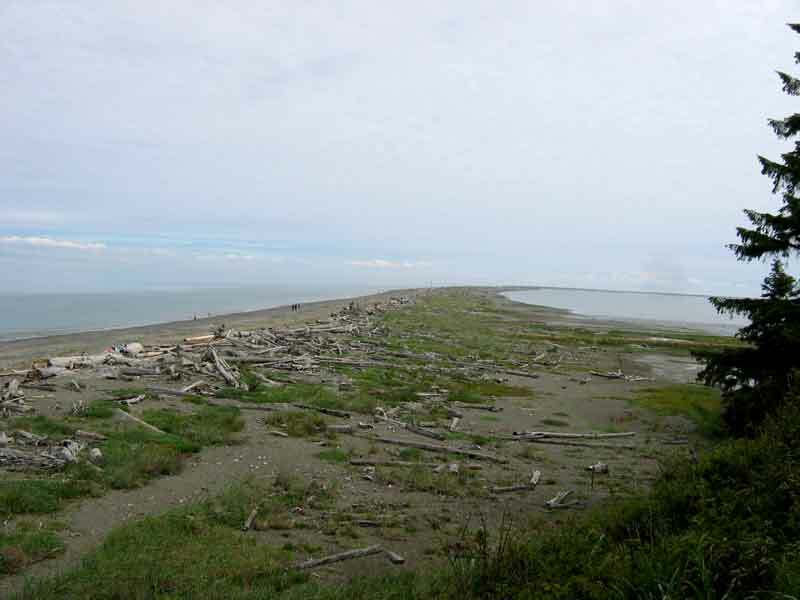 The Dungeness Spit seen here is the longest in the USA. It is six miles long and is a wildlife preserve. You can walk all the way to its end and visit the lighthouse there if you feel up to it. We didn't. 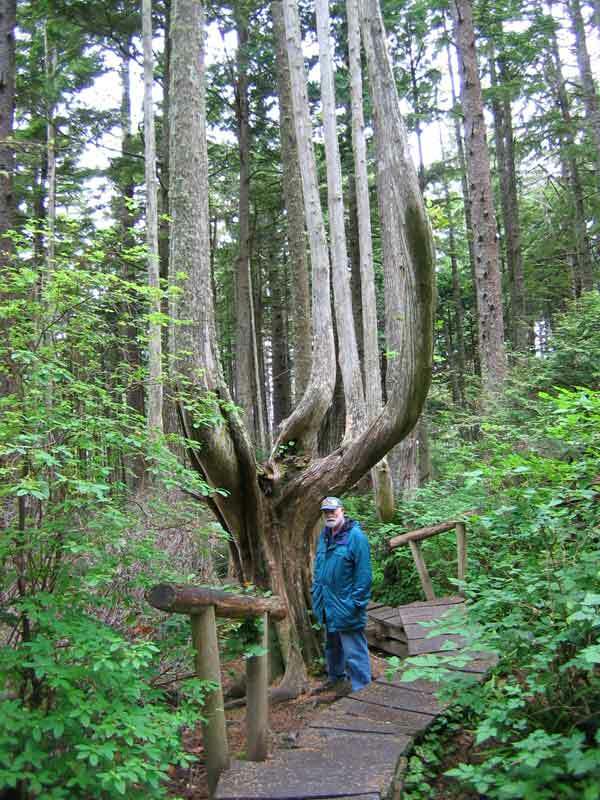 This is a good base for exploring the Olympic Peninsula. It is supposed to be relatively rain free, getting an average of 17" a year, but they must have got their allotment while we were there, as it rained at least once every day during our stay. Regardless of the rain, it was fun to explore the Olympic NP, Cape Flattery and Victoria across the strait in BC. If you drive up to Hurricane Ridge you can see the Olympics spread out before you. 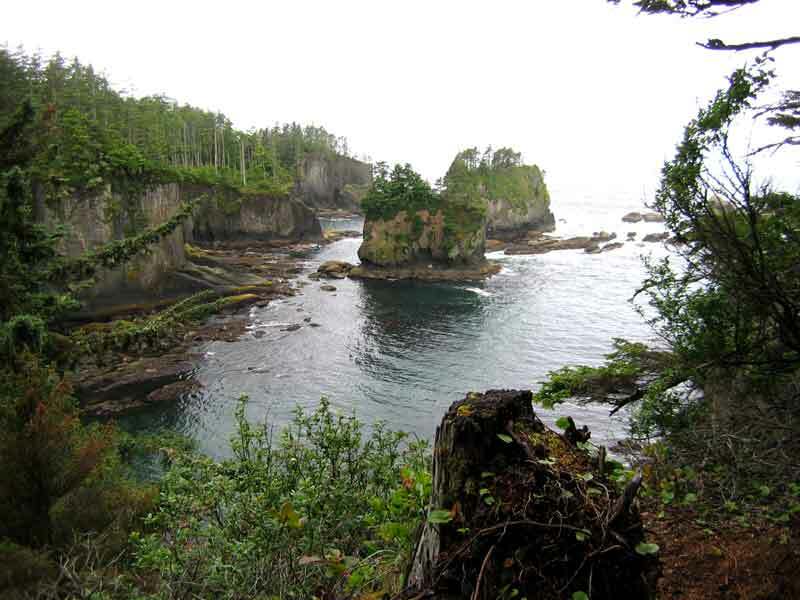 Left: Path through the rain forest on the way to the lookout at Cape Flattery. Right: This is the way some of the trees here grow. 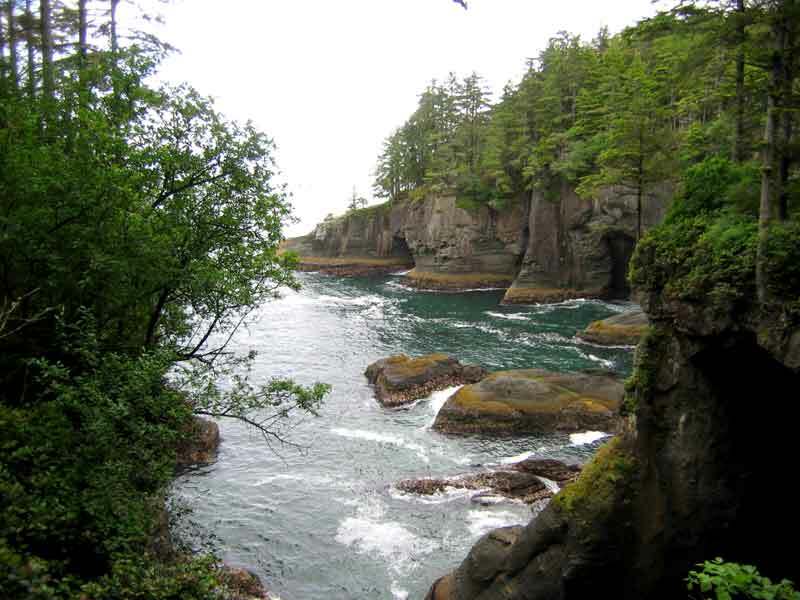 Cape Flattery Lighthouse, the most western point in the contiguous US. We did the math and figured it was cheaper to take the ferry from Port Townsend to Whidbey Island on our drive to Anacortes. The alternative was a five hour, 250 mile drive through Seattle. 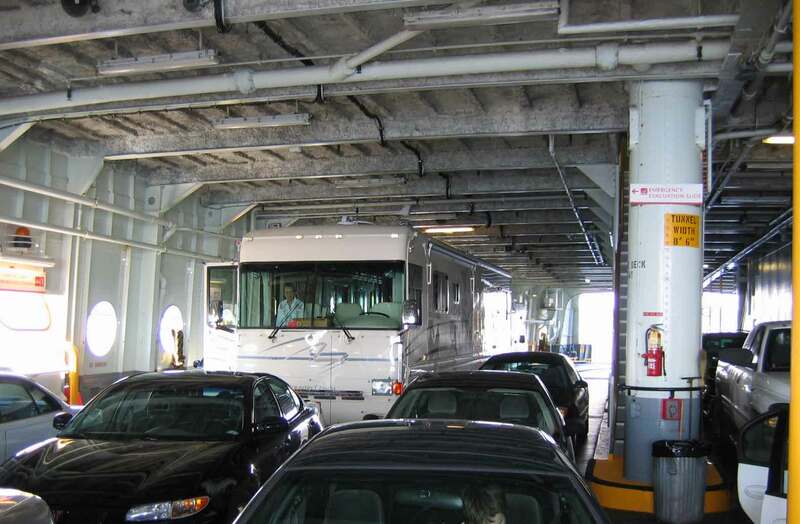 The ferry system works really well and is not a problem with our 40' rig. 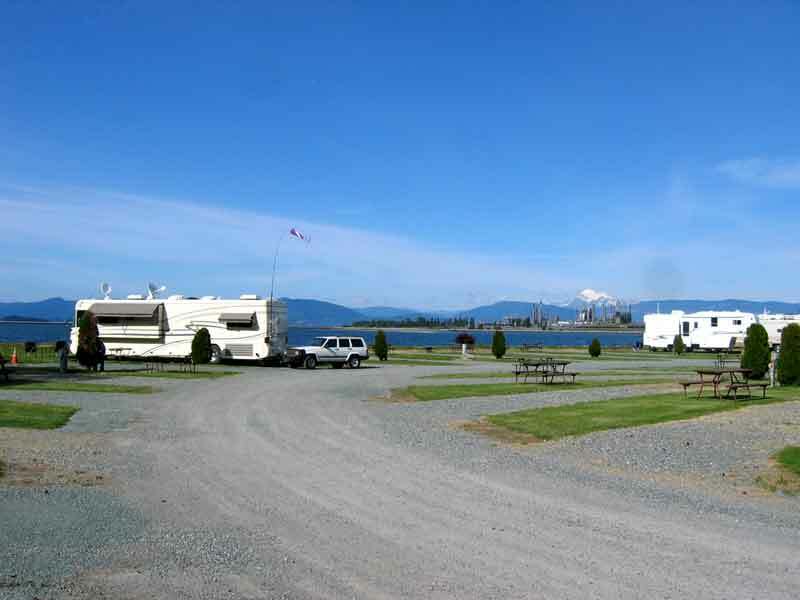 Anne found us a really great campground with a site on the water of Fidalgo Bay. This is our base camp for exploring the San Juan Islands via the ferry system. On a clear day we can see Mt. Baker, so we decided to drive up there and see it closer. 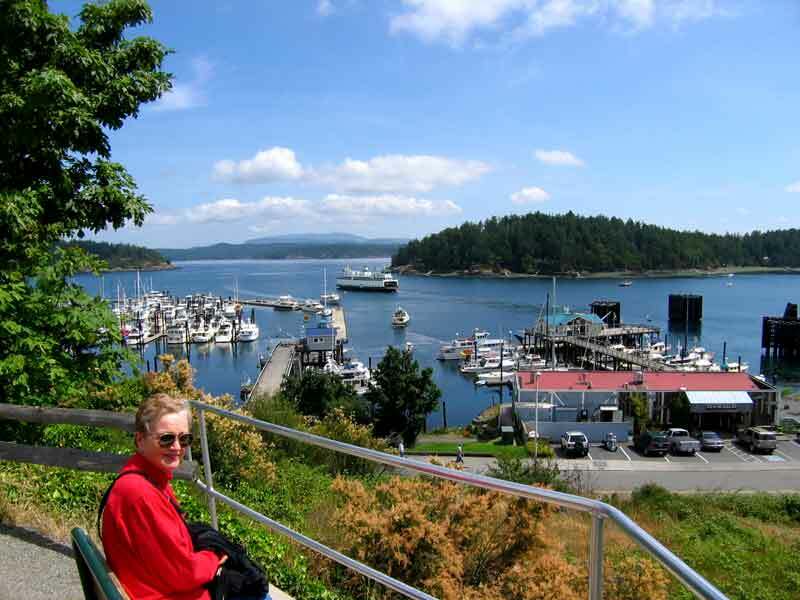 Left: We have a great site at Fidalgo Bay Resort, near Anacortes. That's Mt Baker in the background. 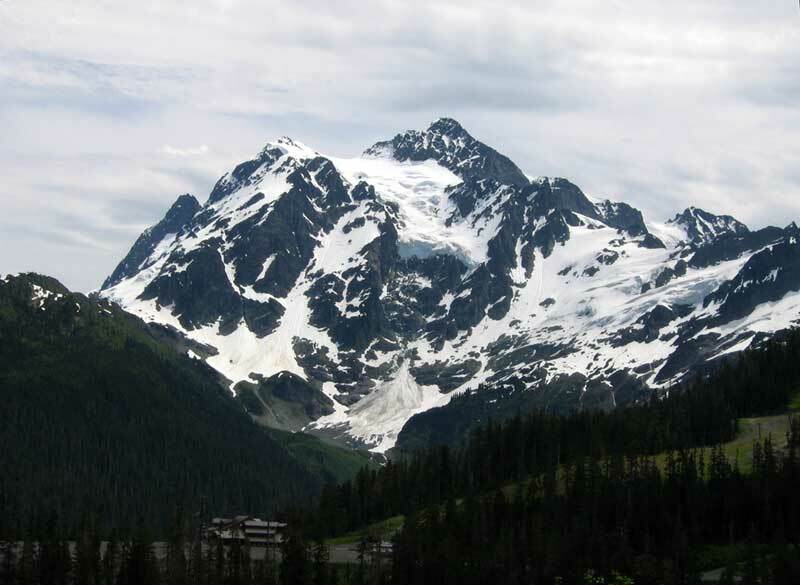 Right: Mt Baker from the ski area near it. You can see several of its glaciers. 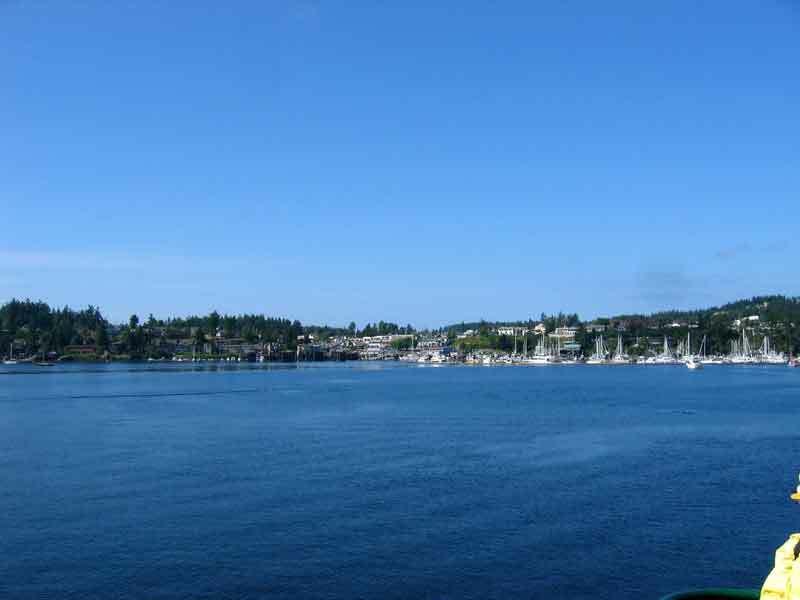 Friday Harbor: This is the center of activity for the San Juan Islands. We took the ferry as walk on passengers and had breakfast as we explored the town. 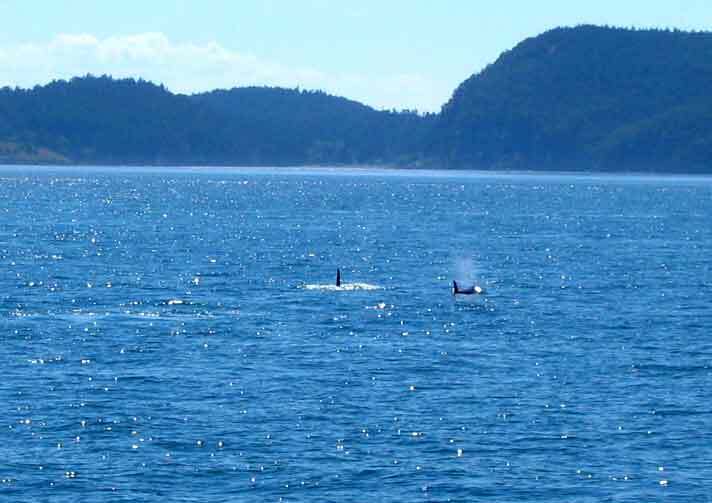 Left: We saw a pod of Orcas as they were feeding, on our whale watching trip. They were spread out and we never got really close, but it was a worthwhile trip. Right: It is still very light at 8pm as we return to Anacortes, with Mt. Baker in the background.